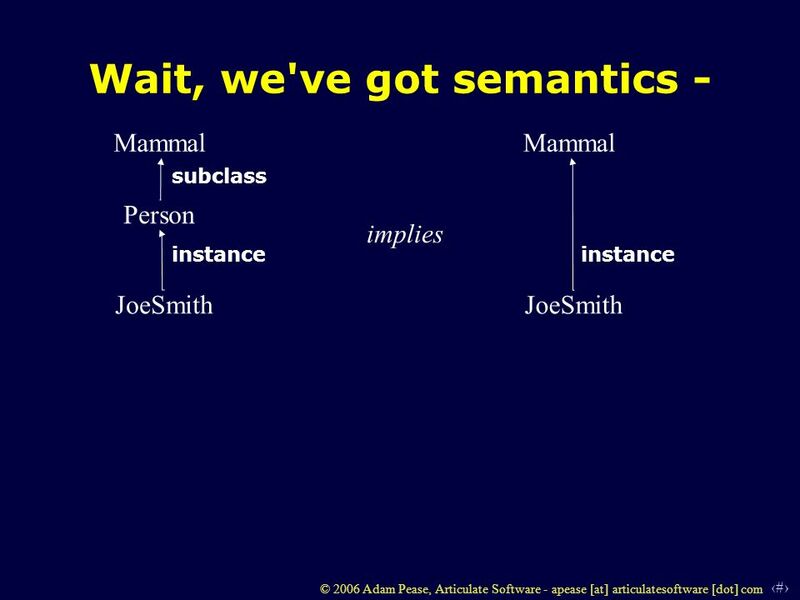 1 © 2006 Adam Pease, Articulate Software - apease [at] articulatesoftware [dot] com Formal Upper Ontology for Interoperability Adam Pease Articulate Software. 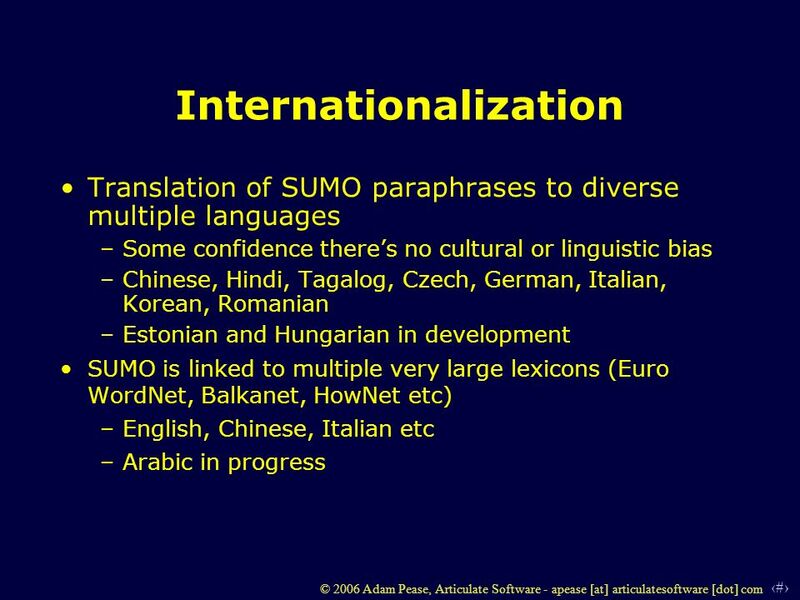 13 13 © 2006 Adam Pease, Articulate Software - apease [at] articulatesoftware [dot] com Are SUMO Terms Directly Usable? Yes. 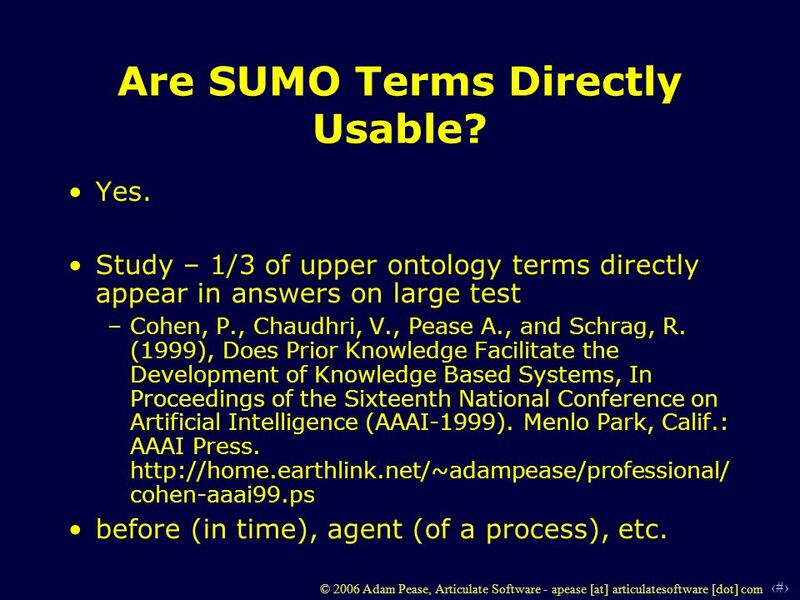 Study – 1/3 of upper ontology terms directly appear in answers on large test –Cohen, P., Chaudhri, V., Pease A., and Schrag, R. (1999), Does Prior Knowledge Facilitate the Development of Knowledge Based Systems, In Proceedings of the Sixteenth National Conference on Artificial Intelligence (AAAI-1999). Menlo Park, Calif.: AAAI Press. http://home.earthlink.net/~adampease/professional/ cohen-aaai99.ps before (in time), agent (of a process), etc. 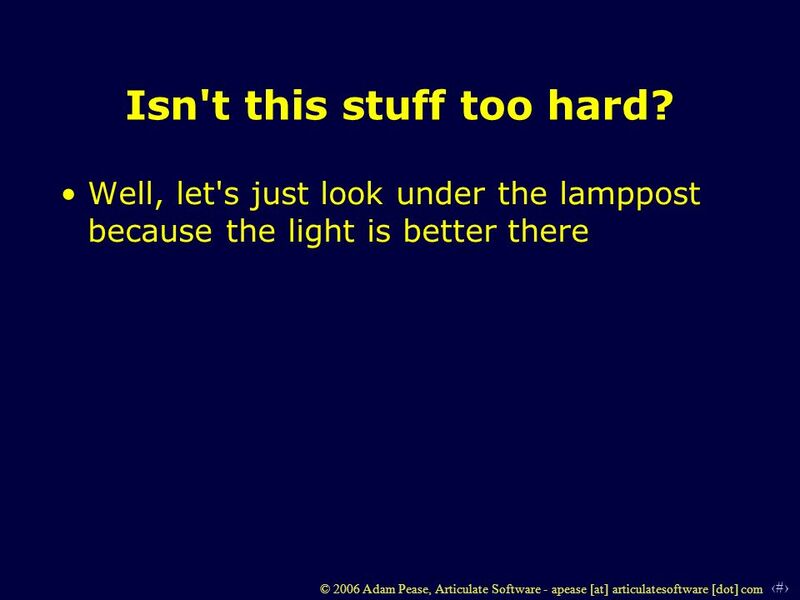 14 14 © 2006 Adam Pease, Articulate Software - apease [at] articulatesoftware [dot] com Isn't this stuff too hard? 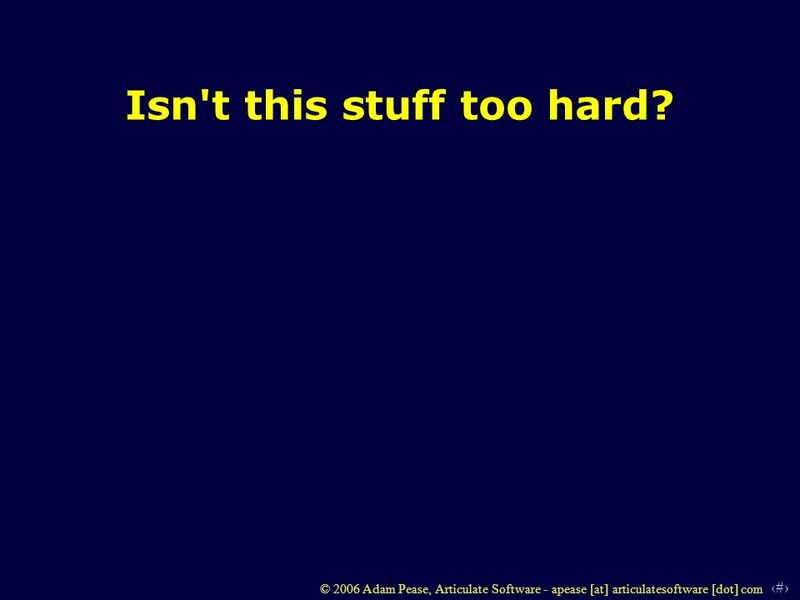 Download ppt "1 © 2006 Adam Pease, Articulate Software - apease [at] articulatesoftware [dot] com Formal Upper Ontology for Interoperability Adam Pease Articulate Software." MEDEFs View on Dot EU Domain Day – 5 novembre 2002 – Palazzo Stelline – Milano Catherine GABAY – Director Innovation and Research - Medef. Content Localization & Gilbane Conference Boston Nov 28, 2006 C. Donner Whats this? Taxonomies. 1 How to Specify Validation Information Roger L. Costello 27 December, 2008. 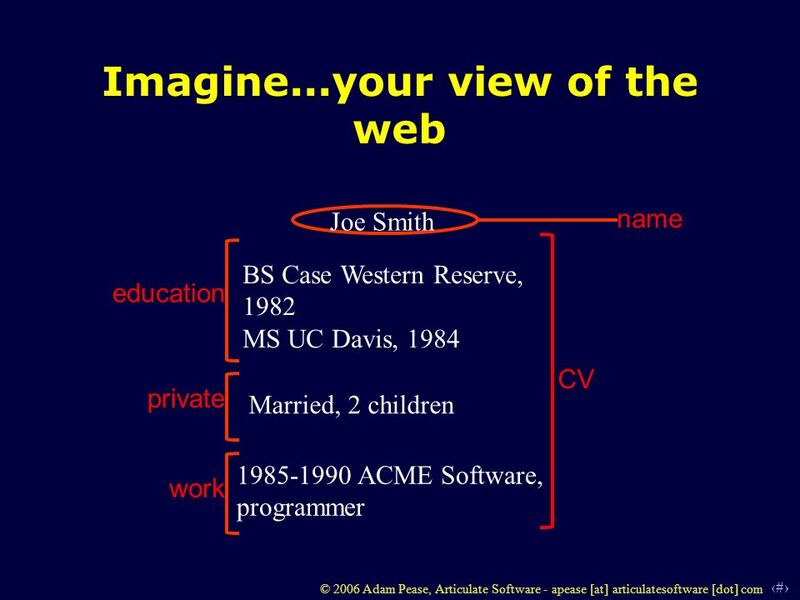 Copyright © 2003 Pearson Education, Inc. Slide 6-1 Created by Cheryl M. Hughes, Harvard University Extension School Cambridge, MA The Web Wizards Guide. 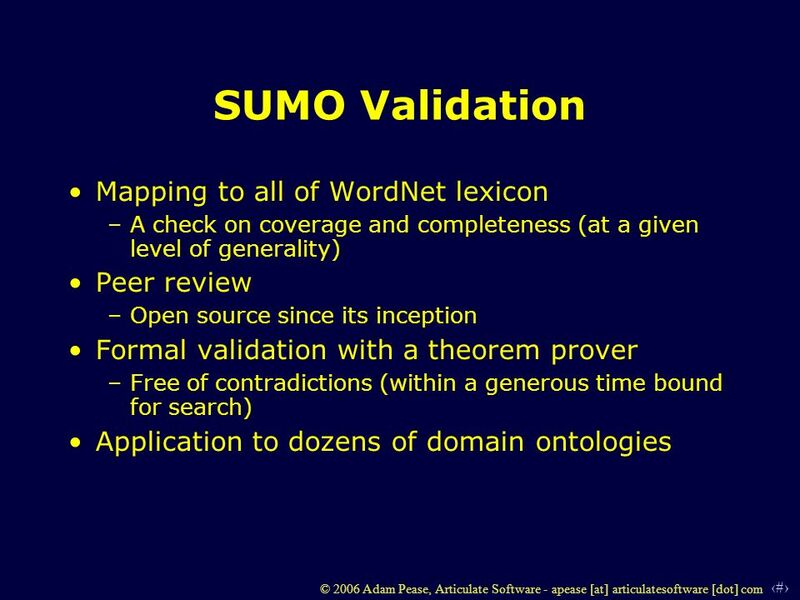 Permission to reuse granted so long as this notice is not altered – Author: Adam Pease 2003 Introduction to Ontologies Introduction. 1 Open Ontology Repository Planning Meeting for Ontology repositories: approaches, technologies, collaboration Ken Baclawski June 15, 2009. 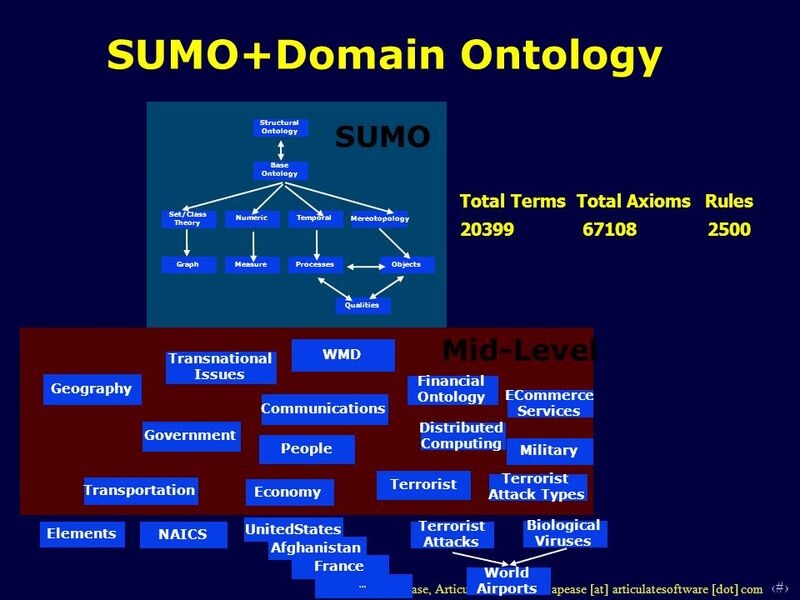 April 23, 2007McGuinness NIST Interoperability Week One Ontology Spectrum Perspective Deborah L. McGuinness Acting Director & Senior Research Scientist. 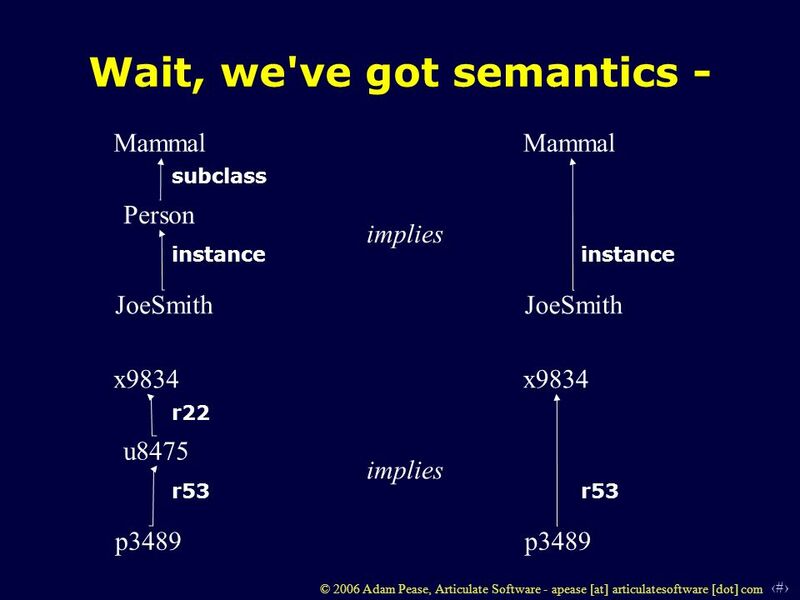 1 Explicit Semantics for Business Ontology - an interim work report from the Ontolog Forum Adam Pease Articulate. 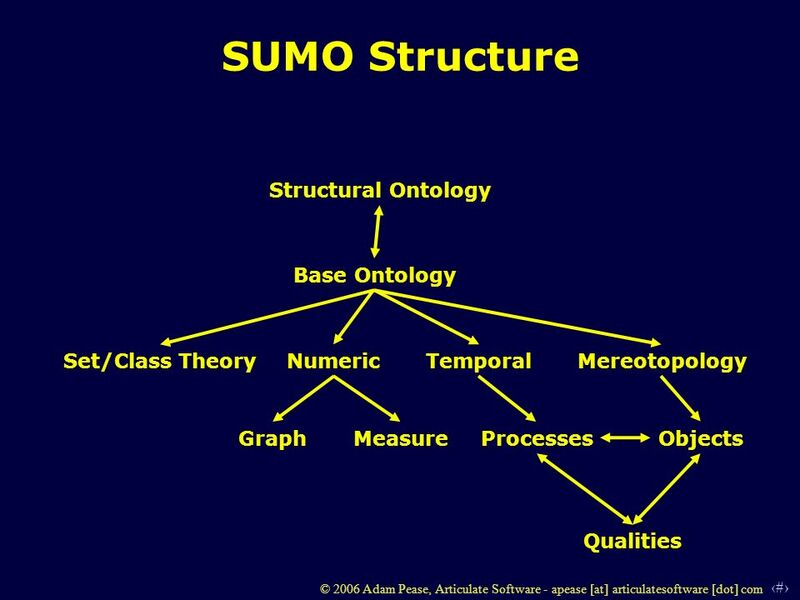 1 © 2007 Adam Pease, Articulate Software - apease [at] articulatesoftware [dot] com The Suggested Upper Merged Ontology (SUMO) at Age 7: Progress and Promise. 1 UOS Application Dialog Introduction Dagobert Soergel College of Information Studies, University of Maryland. 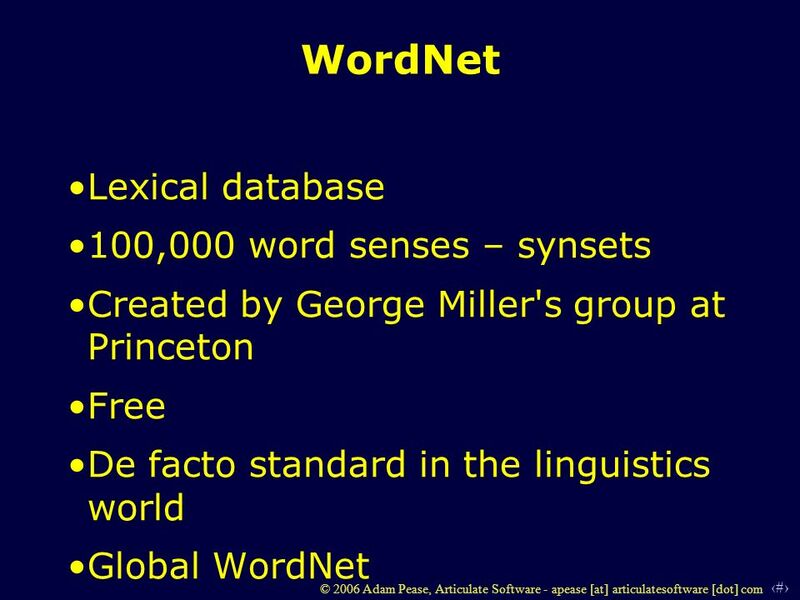 OMV Ontology Metadata Vocabulary April 10, 2008 Peter Haase. 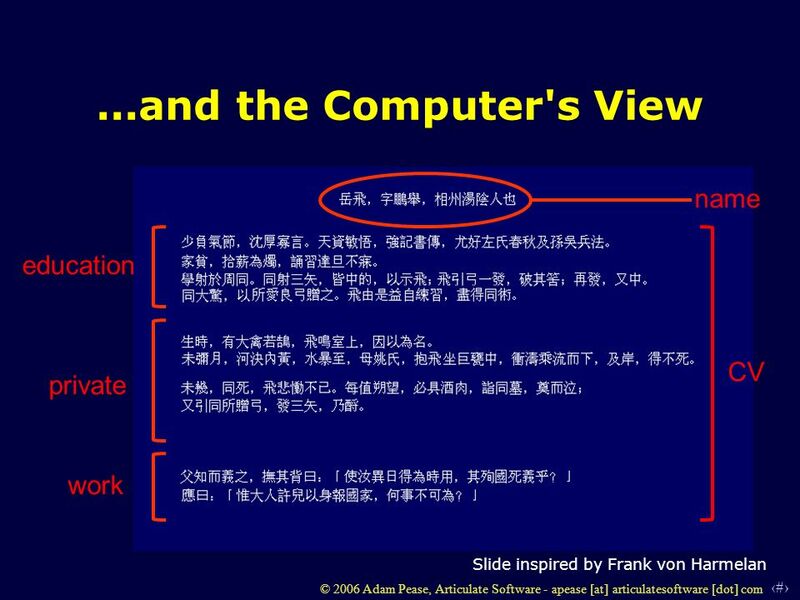 Copyright 2008 Digital Enterprise Research Institute. All rights reserved. Digital Enterprise Research Institute 1 From OntoSelect to OntoSelect-SWSE. Exploratory Development of a UBL Validation Tool Peter Denno National Institute of Standards and Technology. April 20, 2006Sketch 11 Ontologizing Ontolog Content April 20, 2006 Sketch #1 A Roadmap to an Ontolog Thesaurus Bob Smith, Ph.D. CSU/Tall.